Thanks to longtime debates over spec power and a steady longtime decline in racer interest, Super Boat International’s Superboat Stock class has taken a beating in recent years. 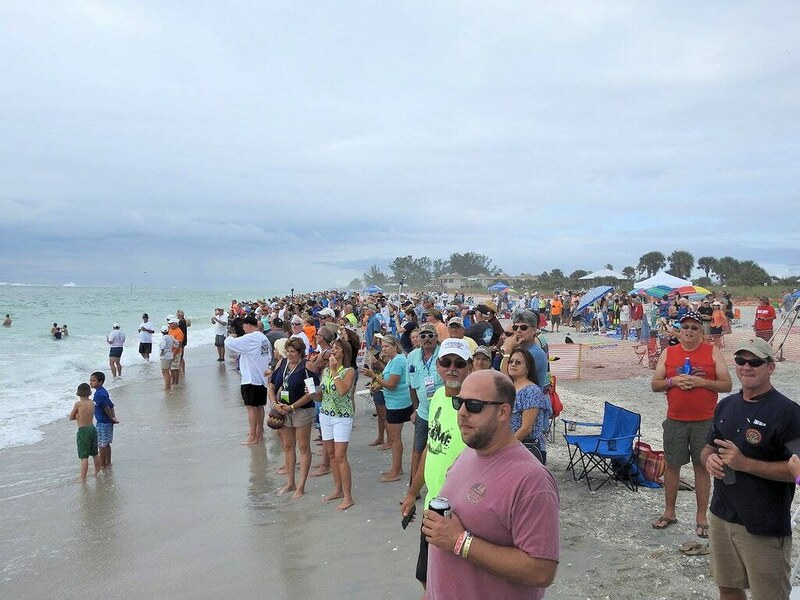 But today’s Stock-class contest—the first race of the day—of the SBI Offshore World Championships in Key West, Fla., proved that with the right teams in the field, the class is as exciting as any under the SBI umbrella. 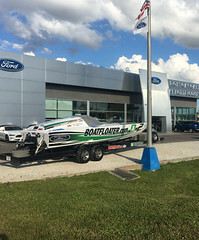 And with a trio of 32-foot twin outboard engine-powered Doug Wright catamarans—Shadow Pirate, FJ Propeller and CR Racing—the right teams definitely were present. Highlights of the race included three different leaders and multiple lead changes. But depending on your perspective, the Stock-class event’s finest moment was either Shadow Pirate recovering from a hard spin in turn No. 3 and coming back to claim first or FJ Propellerstealing second place from CR Racing at the finish line. The final results had Shadow Pirate finishing the three-race week a couple of points and change ahead of its competitors and claiming the 2017 Stock-class world championship. Sunday’s race was the Scafidis’ 18th race together and they enjoyed every minute of it. 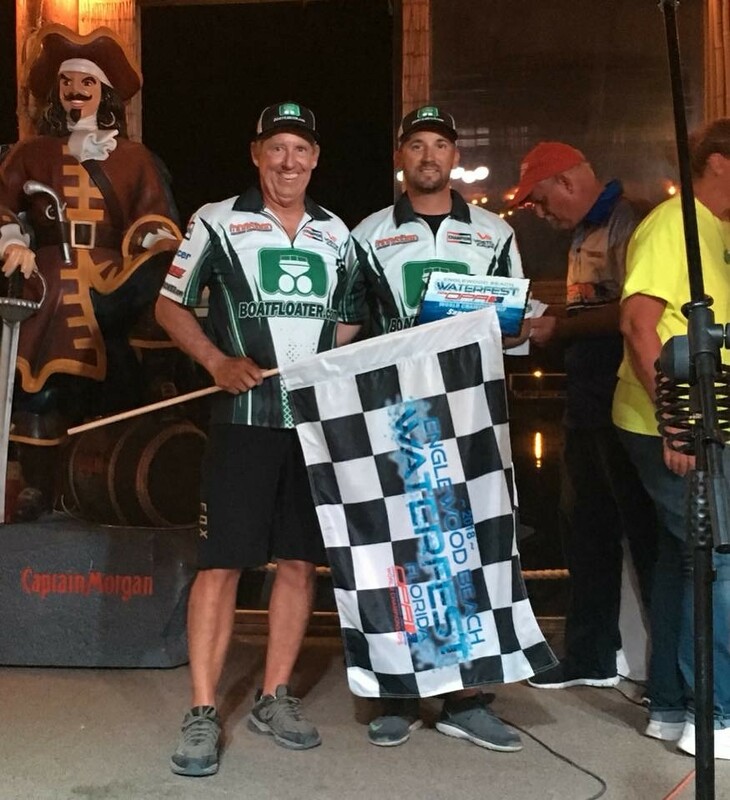 Another father-and-son team—Allen Lawn Care and Landscaping’s Bill and Andrei Allen—completed the three-race sweep in the Manufacturer Production P4 class to claim the world championship in its 30-foot Phantom. “It was a little bumpy today but we were right where we needed to be with the setup,” said Bill Allen, who has enjoyed racing alongside his 19-year-old son for the second year in a row. “The competition was tight with Reinforcer—those guys are good. Our spotters did a great job for us today and we worked really well together. Andrei said it’s fun racing with his dad as his teammate. He also said they are likely moving to a different class for 2018, either Superboat Vee or Superboat Stock. 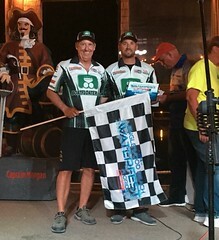 In the Manufacturer Production P3 class, the Second Amendment USA team of Karl Steger and Neil Wobbe earned the world championship in the winner-take-all race ahead of The Developer. The win was Wobbe’s ninth world championship in the 36-foot Spectre catamaran. “This win was a little more special than some of the others because we also won the triple crown as division, national and world champions,” Wobbe said. “For some reason that triple crown has evaded us for several years. The conditions weren’t as bad as we thought they were going to be out there but we still had to be aware and make sure we finished the race. A winner-take-all race on Sunday is always fun. Now we have to get ready for the OPA championships in Englewood (Fla.) next week." Heading into the second race of the day with two first-place results this week, the LSB/Hurricane of Awesomeness/Rev-X Oil cockpit duo of driver Brit Lilly and throttleman Ron Umlandt was the team to beat in the Superboat Vee class. But that didn’t mean anything to the father-and-son team of Steve and Stephen Kildahl in Boatfloater.com, who grabbed an early lead and, despite several hard challenges from LSB/Rev-X Oil on the leg between the first and second turns, was able to hold on—until in the later laps Boatfloater.com almost side by side with LSB/Rev-X Oil—spun out in turn No. 1. The two Extreme V-bottoms collided but both regrouped and went right back to racing. Lilly and Umlandt grabbed the lead and never let it go, going three for three this week and claiming their second SBI world—and national—championship in as many years. “That was some really good racing,” said Lilly. "We picked the right props and were able to run maximum rpm. We were still able to run 90 mph in the rough stuff. Running unopposed in the Superboat Extreme class as they did in the first two races of the week, the AMH Construction/Instigator team of driver Aaron Hope and throttleman Anthony Smith lapped the Superboat Vee-class fleet a few times on its way to another world title. 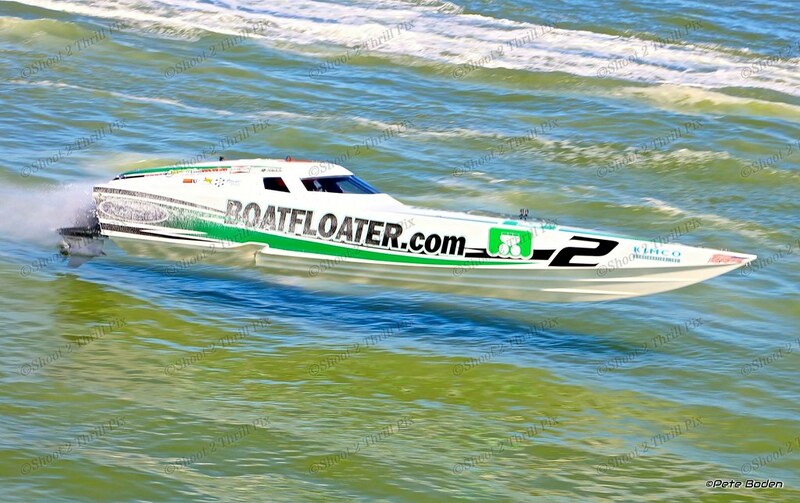 “That win was for Joe Sgro,” said the clearly emotion-wrought AMH Construction/Instigator team owner Peter Meyer, a longtime friend of the fellow Extreme-class racer and Outerlimits Offshore Powerboats principal who died in a boating accident on Thursday. To call the current Superboat-class Miss GEICO team a British invasion wouldn’t be entirely incorrect, other than that the outfit’s longtime crew chief Gary Stray, throttleman Steve Curtis, driver James Sheppard and program consultant Ian Hawkins, while all Brits, aren’t invaders. But don’t let their charming English accents fool you, they’re wickedly competitive as they proved with a strong first-place finish in Friday's contest after finishing a disappointing fifth on Wednesday. CRC/Sunlight Supply had a remote chance—if they won and Miss GEICO and Wake Effects finished way down in the order—of claiming a world title today. 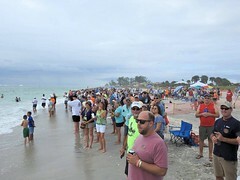 But for all intents and purposes the Unlimited-class contest was a two-boat race for the championship. The 48-foot Wake Effects MTI catamaran piloting pair of driver Rusty Rahm and throttleman Jeff Harris grabbed an early lead, but Curtis and Sheppard chased them down and grabbed the lead roughly midway through the race. Almost immediately after the 47-foot Miss GEICO catamaran pulled ahead, Wake Effects slowed dramatically with a mechanical issue. Rahm and Harris ran for several laps at low speed, but eventually pulled off the course. “I feel relieved, most of all,” Stray said. “We had some struggles over the past two years and we worked and worked to get things right. You know, even when you go out and lose races you put as much work into them as the ones you win. We felt like we’ve really turned a corner on our engine package and Steve and James ran a flawless race today. We had a plan going into it. We know our competitors are squeezing their engines so we said, ‘Let’s stay on their hip, maybe be two or three seconds behind, and see if they break.’ That was the game plan, and that’s how it panned out. The final race of the day, which saw six Superboat-class teams start, didn’t produce drama in the same way the Superboat Stock- and Superboat Vee-classes did. 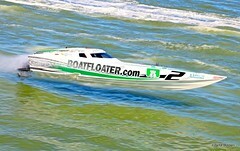 But it did allow the Performance Boat Center/Jimmy John’s team to showcase its dominance of the field. 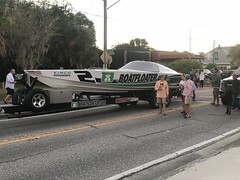 Performance Boat Center throttleman John Tomlinson and driver Myrick Coil led from start to finish in the Sterling Performance Engines-powered Skater 388 catamaran. 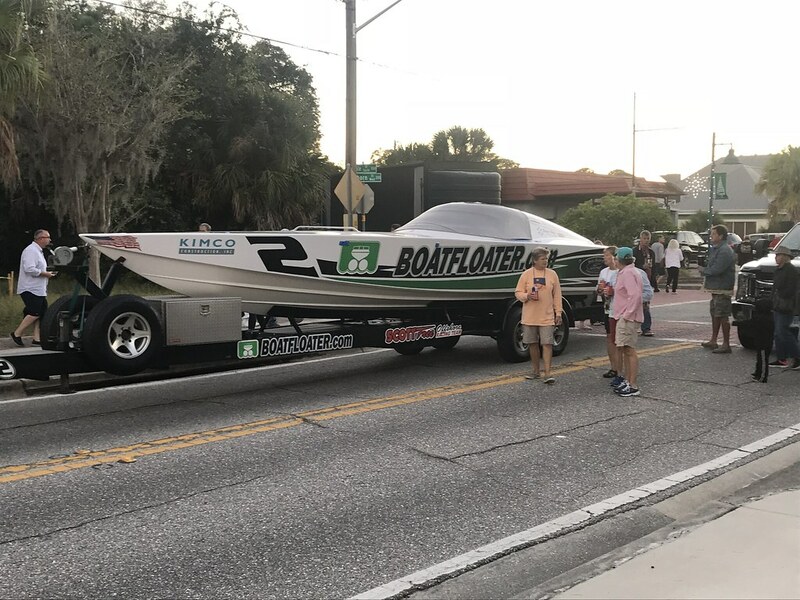 Fellow Sterling power/Skater cat stable-mates WHM Motorsports and STIHL gave chase, but the Performance Boat Center team proved too much to overcome. For Tomlinson and Coil, claiming their second consecutive world title came down to patience and course/conditions management. “We knew we had to beat WHM to win the championship,” Tomlinson said. “He got a good run into turn No. 1 at the start, but between turn No. 1 and turn No. 2 we were able to keep the boat in the water better and take over the racecourse. It was getting rougher and rougher starting around lap eight so we tightened it up. But I could see our gap ahead of WHM was changing, so we had to run it hard again. All Contents © copyright Scott Free Racing.